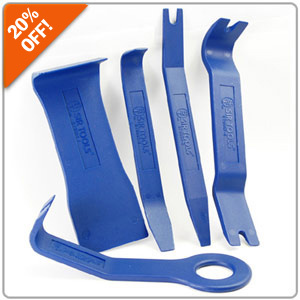 20% OFF the Ultimate Interior Trim Removal Kits! Tackle your upcoming interior project with a set of quality tools designed specifically for use on soft as well as hard trim pieces. The 5 & 11-Piece Kits feature double ended tools (except for one) and was designed to safely remove door panels, delicate trim strips, dashboard panels as well as aid in window installation. Don't forget to use promo code TRIM20 at Step #5 of your Checkout where it says "Have a Promo Code? Apply it Now." CLICK HERE to purchase yours today! Last day to take advantage of savings! Promo ends tonight at 11:59pm PST. All times are GMT -8. The time now is 12:40 AM.